More organizations are opting for modified shipping containers for storage, workspace, living space, and equipment enclosures than ever before. But what surprises many first-time Falcon Structures’ customers most is the variety of container modification options we can provide. To be clear, our line of standard container products was designed to meet most business’ needs from the get-go. Still, it isn’t unusual for our customers to ask for modifications here or there, so the final product meets their specific needs. That’s why we also developed a catalog of pre-engineered modifications that can be integrated into just about any container project. So what shipping container modifications do Falcon customers ask for most? 1. Exterior branding. If there is a specific color or two associated with your brand, Falcon can paint the exterior of your conex container to match. Signage with logos, phone numbers, hours of operation, etc. are also popular. Magnetic signs are another nice option, since they can be swapped in and out at as needs change. 2. Interior paint. We typically paint raw container interior walls the same color as the container exterior, but we’re happy to swap in another color. 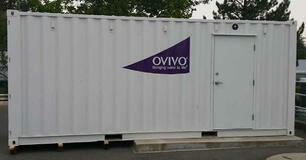 For standard container products with interior build-outs – offices, workforce housing, etc. – walls are painted a creamy, white color. Again, if you prefer a different color, that’s an easy change. 3.Flooring. 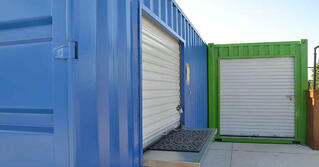 Falcon’s container structures come standard with moisture-resistant, marine grade flooring. For professional environments – mobile offices, conference rooms, training rooms, etc. – many people prefer the more finished look of vinyl flooring with a modern, homey, wood plank design. For utilitarian applications – like mobile restrooms – where easy cleanup is important, durable, slip-resistant polyvinyl flooring is ideal, because it can be hosed down in minutes. We also offer heavy-duty spill containment flooring options for test labs and industrial equipment enclosures. Just ask. 4. Workspace upgrades. We regularly install built-in work surfaces into container offices. The ready-to-use work surfaces come in 8-ft sections with laminated counter tops. Bulletin boards, white boards, wall filing systems, and shelving are also available. 5. Full or partial kitchenettes. 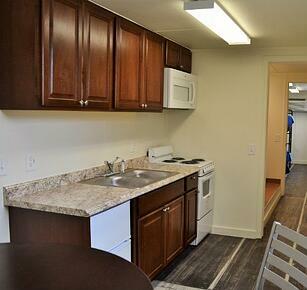 Container interiors can be modified to include a partial kitchenette – space for a mini-fridge, microwave counter, and seating – OR a full kitchenette with turnkey plumbing, a sink, and space for a stove, full-size fridge, and seating. 6. Lighted personnel doors. To allow more light into your container structure, add a lighted personnel door. These sturdy, steel doors include a large window and choice of locking mechanisms – keyed or keyless entry. 7. Motion sensors. For more security, we can add motion-activated lighting to the interior and exterior of your shipping container. Consider LED lighting to help keep energy costs down. 8. Restroom facilities. Several of our standard container products come with a built-in half bath. However, we can design a restroom configuration that meets your specific needs. 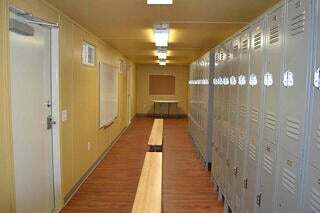 Check out our conex locker rooms and comfort stations for more insight. 9. Chassis. If you plan to relocate your container structures frequently, it may make sense to install the container directly on a chassis. That way, you can easily hook up to a truck and go. We offer chassis for 20-ft containers (gooseneck or bumper pull) or 40-ft containers (gooseneck). 10. Rooftop deck. Take advantage of the open air and space above your container. Add a structurally sound rooftop deck,* railings, and an OSHA-compliant steel staircase. Our customers use rooftop decks for surveying work sites and also for recreational purposes. We can even add artificial turf if you like. Want to learn more about the modification options available for your shipping container project and the associated costs? Give us a call at 877-393-4219 to speak with one of our friendly sales reps.